This training system is designed to improve motor skills while enhancing attention skills. The instruction teaches the basic fundamentals of self-defense in a positive environment that helps foster a positive attitude in the kids. All classes are taught using the most safe, fun and exciting instruction methods available for this age group. This program works in conjunction with the Karate for Kids program, thereby emphasizing the same important monthly themes and value system. This is a great way for kids to get exercise and have fun! Victory Stars are awarded for turning in monthly “worksheets” based on the life skill we are emphasizing that month, for good attendance, participating in tournaments, and for outstanding performance in school or at home. Victory Stars may be placed on the Victory Patch and are awarded for age-appropriate good behavior and performance. The Tiny Tigers system is based on a lifetime learning concept in addition to technical skills. Our basic building blocks for the Tiny Tigers system are monthly themes, including the following: Courtesy, Respect, Integrity (Honesty), Confidence, Perseverance, Self-Discipline, Goal-Setting. 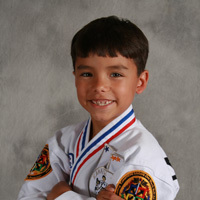 The Karate for Kids system is based on a lifetime learning concept in addition to technical skills. 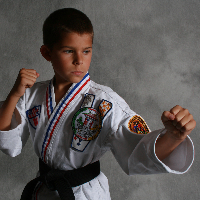 Our basic building blocks for the Karate for Kids system are monthly themes, including the following: Courtesy, Respect, Integrity (Honesty), Confidence, Perseverance, Self-Discipline, Goal-Setting. The concepts from these two safety packages are implemented in both, our Karate for Kids and our Tiny Tigers training systems. In an era when parents can’t keep their children in their sights 100% of the time, the safety education offered by these programs helps ensure children stay out of harms way, and gives them the techniques and confidence to escape a potentially dangerous situation.